Once, Jesus got into a boat with His twelve disciples. 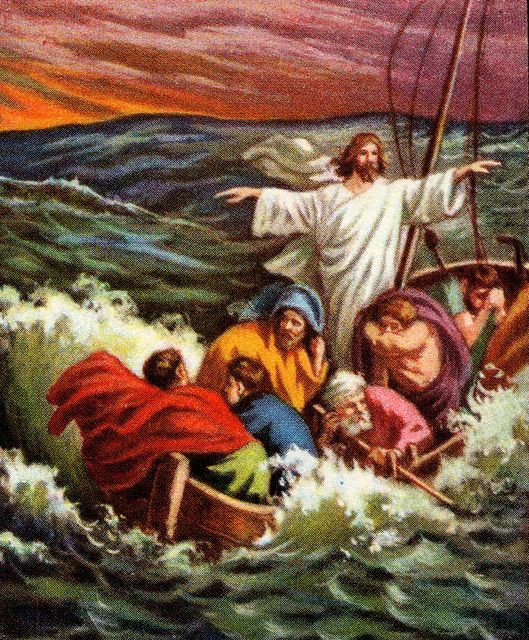 Jesus said to His disciples, “Let us get into a boat and cross to the other side of the lake.” And so they put out the sail boat and started sailing on the lake. Jesus felt very tired and he fell asleep in the boat. Suddenly a strong wind blew and a severe wind storm swept through the lake. The violent winds caused the water of the lake to rise up in high waves. The waves from the lake broke into the boat and the boat began to be filled with water. When Jesus’ disciples realized that they were sinking, they were very afraid and panicked. The disciples don’t know what to do so they quickly went to wake Jesus up to help them to calm the wind storm. Jesus who was asleep at that time was aroused by the disciples and He woke up. Jesus purposely slept through the storm because He wanted to test the faith of His disciples. Then Jesus rebuked the wind, saying, “Be still.” And the wind immediately calm down. After that, they arrived at the country Gadarenes which is opposite of Galilee.